Pretty amazing deal … the Kindle 4, which retails for $79, comes with a $30 Wal-Mart gift card at Wal-Mart the week starting April 29. 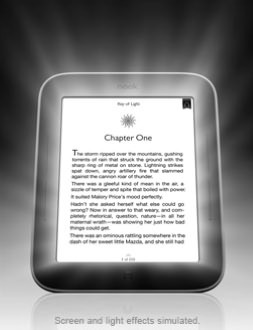 That makes the final price just $49 for the latest-generation e-Ink Kindle. 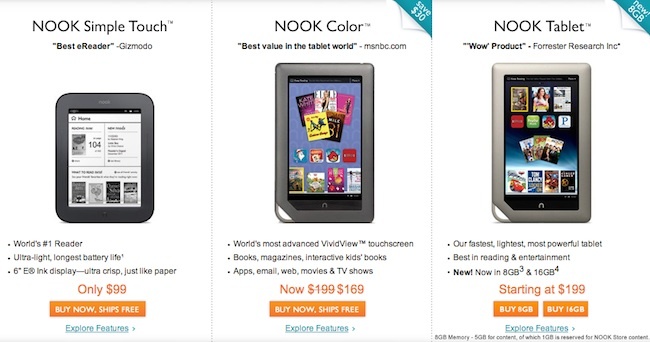 It’s a pretty phenomenal deal, even though this is the non-touchscreen Kindle version (some of us don’t want fingerprints on our screen anyway and prefer page turn buttons), and it comes with “special offers.” More info on Amazon’s website here, or my blog posts here. 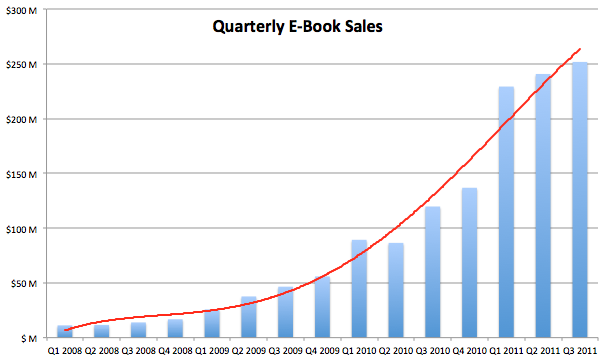 If you’ve been looking to jump into e-reading, but don’t want to spend much money, this is the deal for you. 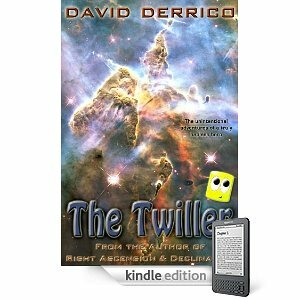 $79 is already a pretty attractive price for a Kindle, which gets you a 6″ Pearl e-Ink screen, Wi-Fi connectivity to download books wirelessly, adjustable text sizes, dictionary look-up, and access to Amazon’s world-leading e-book store, plus thousands of free public domain e-books. Add in the $30 gift card, and it’s like spending less than $50 for the Kindle — which is the cost of a couple of hardcover books. 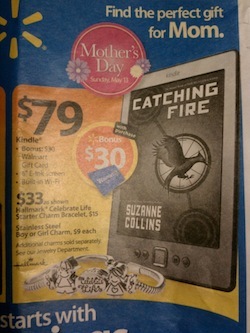 If you want to grab this deal (perhaps as a Mother’s Day gift? 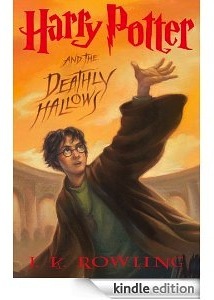 ), it will probably only be available at Wal-Mart for a week, from April 29 to May 5. 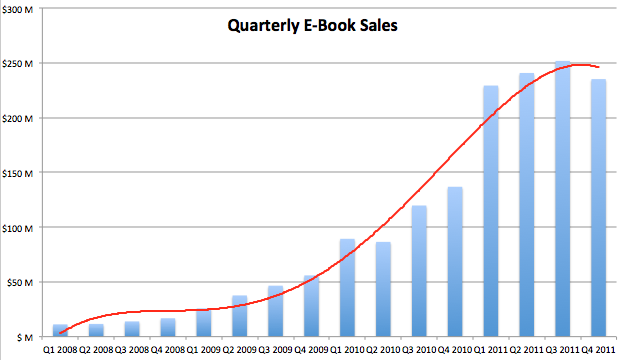 The quarterly sales of just over a quarter of a billion dollars help push e-books to $727.7M for the first 9 months of the year, an increase of 137.9% over last year, and close enough that a strong holiday push could put e-book sales at a billion dollars for the year, as I predicted after February’s sales. 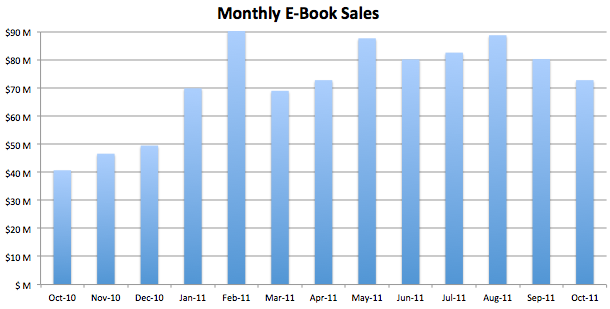 Fairly brutal numbers across the board, with only a slight (2.1%) increase in young adult hardcover, flat adult trade paper sales, and decreases in the other categories, including a dramatic 54.3% decrease in mass-market paperback sales. 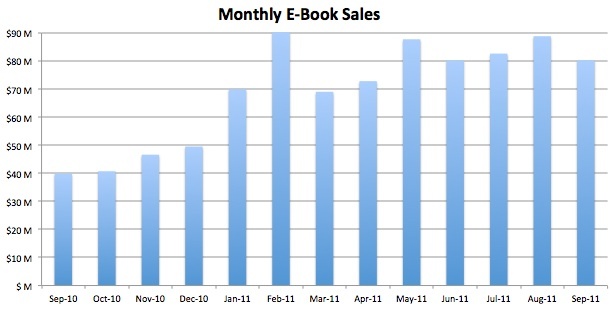 People have said that mass-market paperback sales are the most susceptible to being replaced by e-book sales, since they are generally fiction novels that people read once and then discard or donate — as opposed to hardcovers that people like to display on their bookshelves. 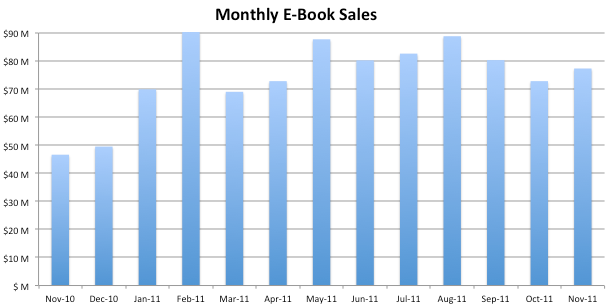 The numbers are bearing that out, as e-book sales, which just last year were below mass-market paperback, are now nearly triple. 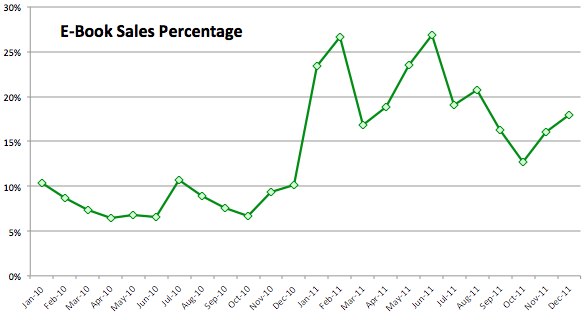 The AAP also pointed out that sales in all print trade segments were down for the 9-month period so far this year. 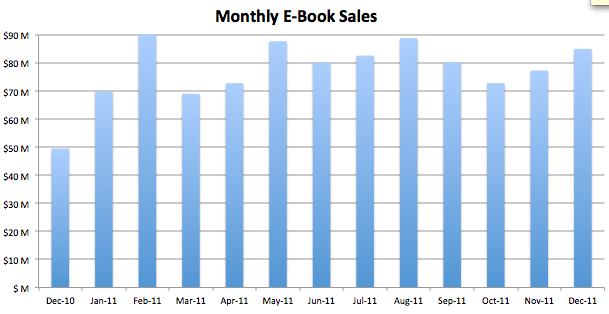 Based on those estimations, e-book sales accounted for 16.25% of combined print/e-book sales for the month, roughly double the 8.17% overall figure from 2010.